Get some fish into your diet with this flavourful Mediterranean delight. Preheat oven to 400°F. Cut block of fish into 4 equal chunks. Mix zucchini and tomatoes in 9-inch square baking dish; top with fish. Spoon 1 Tbsp. of the dressing over each piece of fish. Bake 15 minutes; sprinkle with cheese. Bake an additional 8 to 12 minutes or until fish flakes easily with fork. Serve with lemon wedges. Any frozen mild flavoured white fish will work in this recipe. 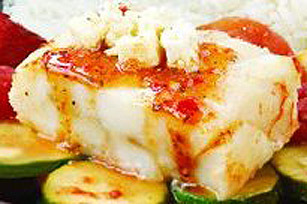 For starters, try haddock, sole, whitefish, bluefish or halibut. Good source of B vitamins and moderate dietary fibre.